Like clockwork, each and every single weekday morning, the MLSP leaders come out and give enormous value to our community. They help you get the day going with the mindset you need to succeed, and the lessons that they’ve learned on their journeys to their own success. They share the mistakes they’ve made, the obstacles they’ve faced, and the solutions they’ve come up with to succeed anyway. This week was no exception and you’ll see exactly WHY you should be showing up everyday right along with them! 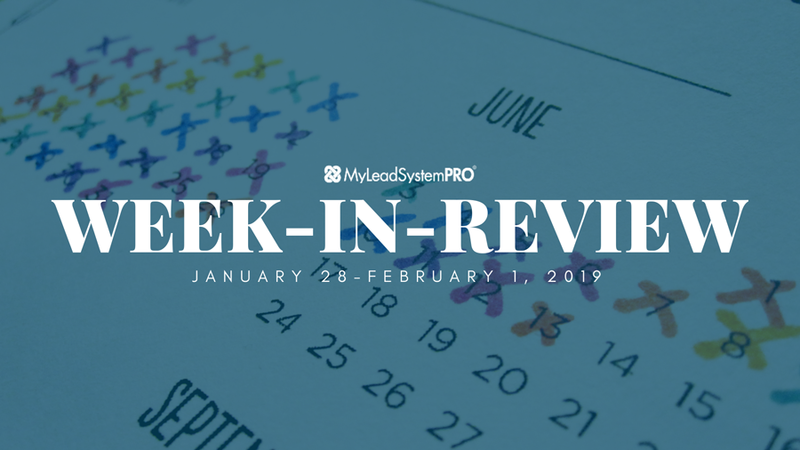 We’ve posted all the amazing content they shared throughout the week below! Are you using Facebook ads to promote your products, service, or opportunity? If not you’re missing out on one of the best ways to promote a business available today. If you are on the right track. But like any good marketer, you’d probably love to see how to make your ads more effective. And that’s exactly what L5 Antonio Thompson revealed on the MLSP Wake Up Call. Get tips from an absolute FB ads expert and take your business to the next level! Why Facebook advertising is the most effective way to build a business in 2019! How to put an effective ad directly in front of your best prospects for as little as $5 a day! The first critical step to take when you start using Facebook ads! How to pinpoint target the exact audience you want to reach and do so with laser accuracy! Antonio knew that the MLSP community would love what he was talking about, so he hopped right over to the MLSP Facebook Page and went LIVE digging into how YOU can take your Facebook ads to the next level! Most business owners are doing themselves a disservice. They’re sticking their heads in the sand when it comes to certain aspects of their business. What you don’t know in your business truly can hurt you. It can leave you stuck, broke, overwhelmed and confused. The key to getting away from all that is knowing MORE about your business, so you can fix what’s broken, and/or improve on what’s working! This is certainly a lesson that L7 leaders and $6-Figure per month earners Todd & Leah Getts had to learn along the way. While they’re now experts on getting more followers and leads on Twitter and dominating Instagram, it took knowing some certain numbers! That’s exactly what they talked about on the MLSP Wake Up Call on Tuesday! The big mistake that most people are making with tracking, and why it’s vital you stop immediately if you want to move forward! How to stop shooting in the dark with your business and begin to know EXACTLY what you need to start doing next! What numbers to keep close track of in your business so you can start increasing your lead flow, sales, and sign-ups! Todd and Leah are constantly giving back to this community, and that’s exactly what they did when they went LIVE from the MLSP Facebook Page on Tuesday. Watch below and see the parameters of your business that you must start following if you want to get more leads, sales, and sign-ups on ANY platform you want! Most people tell you that you MUST find your WHY. Maybe it’s getting out of a job, retiring your spouse, traveling, or all of the above. Your why is unique to you, and chances are you already know it. But L5 leader Erin Birch knows that you may be missing the other critical element, which is your WHAT! That’s exactly what she went over on the MLSP Wake Up Call on Wednesday. Plus she gives you the exact steps to find out what it is! What your “what” actually is… and why it’s what you ultimately want to accomplish! 3 steps to uncover YOUR what so you can start growing your business faster and create laser focus! The 1st step that you need to take immediately to get in touch with YOUR what? Erin Birch wants you to see the kind of amazing success that she has seen over the past couple years. That’s why she went LIVE from the MLSP Facebook page to go even further into the topic of finding YOUR what! You may not realize it, but there’s a goldmine right in your own backyard in YOUR hometown. MLSP leader and super coach Steve Krivda went over what that looks, and how you can tap into it on the MLSP Wake Up Call on Thursday! How to actually help the economy in your own backyard, and help local business’ grow their businesses! How to create a realm that makes people think of YOU when it comes to creating a name in their marketplace! Where to go inside the MLSP back-office to give you the most leverage for helping local businesses! Steve is always ready and willing to over-deliver, and that’s exactly what he did when he went LIVE on the MLSP Facebook Page directly after his call on Thursday! Are you “faffing” in your business? If you’re like most people you likely are. And that needs to stop if you want to start cashing in on your business instead. L5 leader Kay Somji called into the MLSP Wake Up Call on Friday to go over what all this means. This guy went from “faffing” and struggling to becoming a force when it comes to social media marketing. He shows you how to avoid making the mistake on your business in the replay below! What “faffing” means and what it means for YOU and your business! The important lesson that Kay learned from “faffing” around with his business. Why most people overlook this concept and how it hurts them from achieving their dreams! The huge mistake that people make that keeps them from cashing in on their business. Kay hit the LIVE button from the MLSP Facebook Page to dive even deeper into this concept of “No faffing and more cashing”. You’ll want to watch this so you can start cashing in more! It All Starts Now for YOU! You’ve just got some massive value from some of the top marketing and coaches online. These business owners know what it takes for you to become successful, and they gave you hard-earned secrets at zero-cost! Now it’s your time to go out there and put these concepts to use, and start taking your business to the next level. Wondering what that looks like when you do? Check out the latest success stories from inside MLSP here!